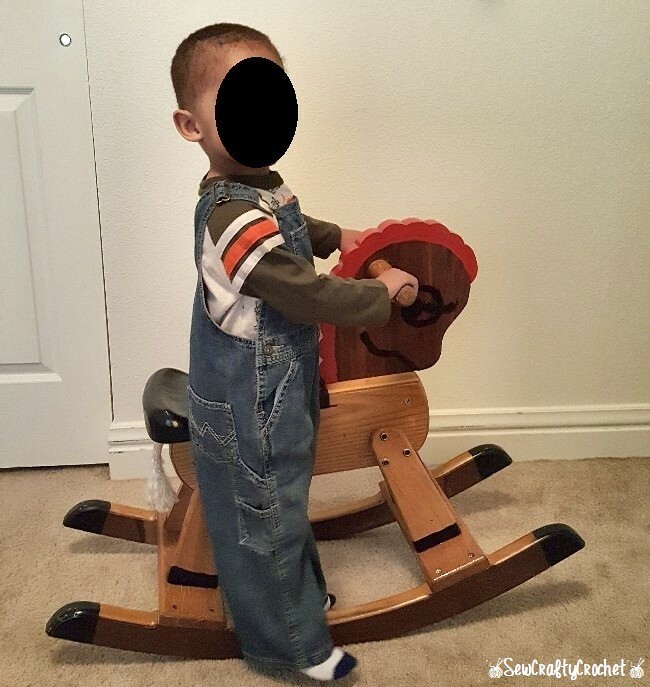 A few years ago when my daughter was still a toddler, my father gave us an antique rocking horse for her to play with. I knew that eventually I'd like to give it a makeover. Well, I finally got around to it! I figured I should go ahead and repaint it before my son outgrows it. 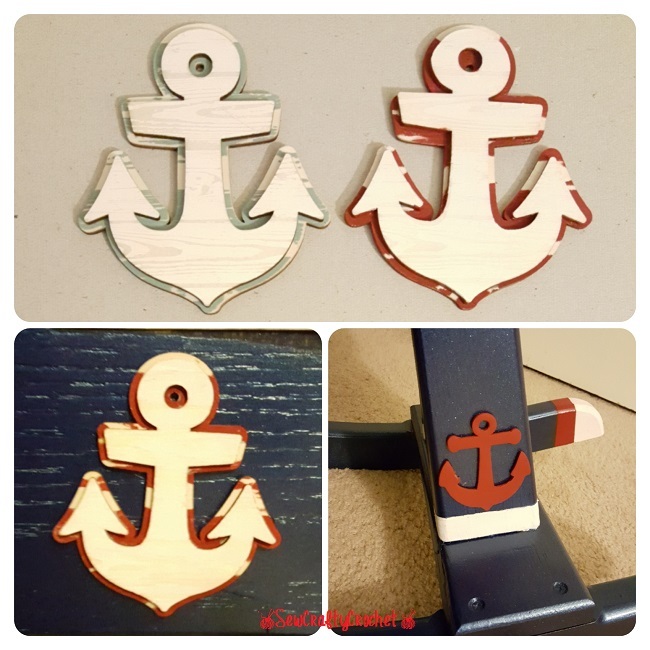 Since his room has a nautical theme (and I love all things nautical! ), I decided to paint it to match the theme of his room. So it just happens to be red, white, and blue. Here's how the how looked before I painted it. 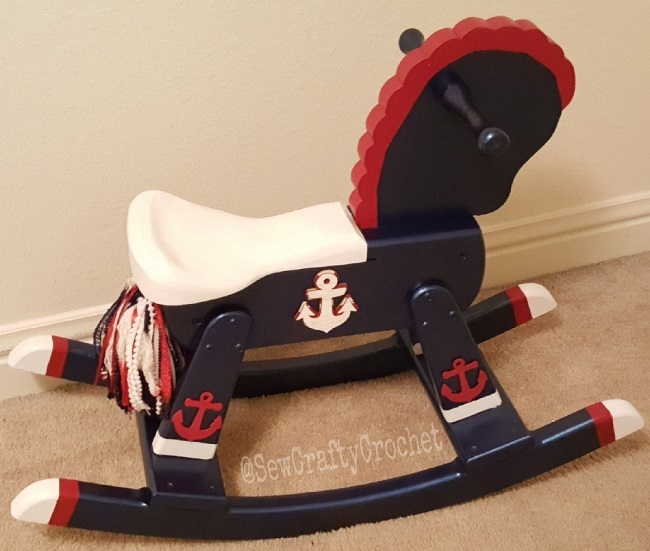 I really wanted to give this horse a nautical look with anchors and whales and sailboats, etc. 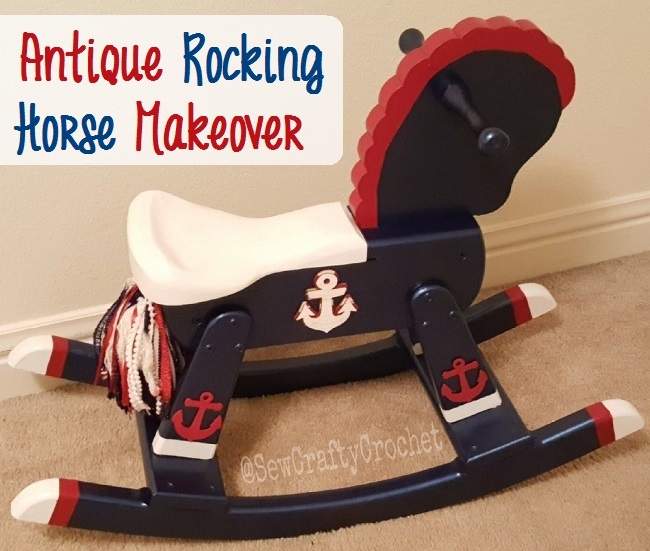 I began this makeover by taping the parts of the horse that I did not want to be painted blue. I used Rust-Oleum Metallic Spray Paint in Cobalt Blue . I also used this paint to paint my daughter's old Dora the Explorer toddler bed before handing it down to my son. 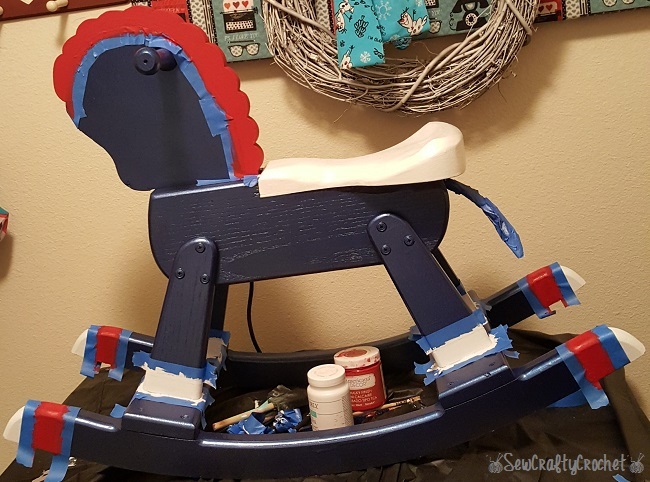 After the blue paint dried, I painted the seat white, the mane red, and added red and white accents. For this I used Deco Art Americana Chalky Finish Paint in Romance and Waverly Chalk Paint in White . After the red and white paints dried, I applied a coat of chalky paint varnish . 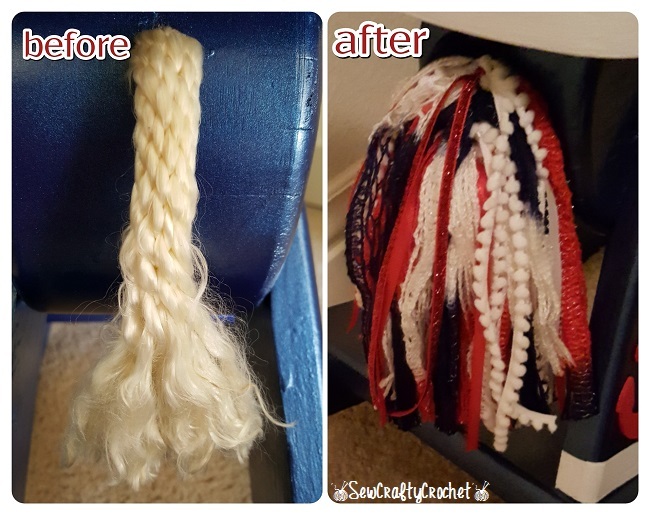 After all the paint dried, I gave the pony's tail a much needed makeover with red, white, and blue yarn and ribbon. I knew my Patriotic Red Heart Boutique Sashay yarn was perfect for the tail. The white yarn (Red Heart Baby Econo Yarn in White Pompadour) has been in my stash for many years. 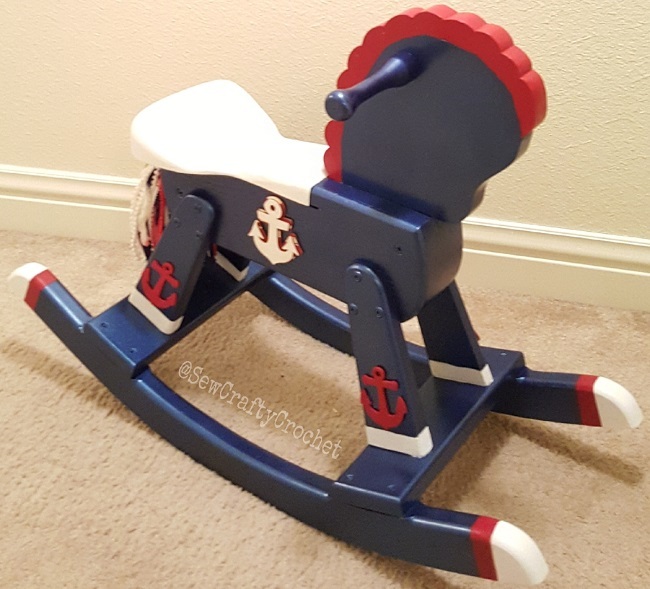 Now, the rocking horse matches perfectly with my son's nautical big boy room! 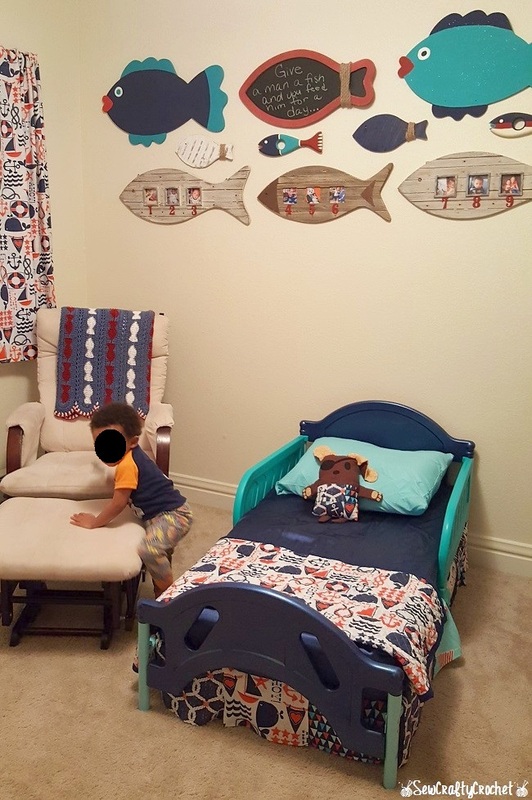 In this photo, you can see Patches the Pirate Puppy, the Ahoy Matey Quilt, Ahoy Matey Nautical Crib Skirt, the Wall of Fish, and the Crochet Fish Baby Blanket I made for my son. This bed was my daughter's Dora the Explorer toddler bed, but I painted the pink parts with the Rust-Oleum Metallic Spray Paint in Cobalt Blue , and now it's my son's bed. My kiddos definitely noticed that the rocking horse has changed! My daughter says she loves it, especially the tails. And my son has been rocking on it as usual. Yay! 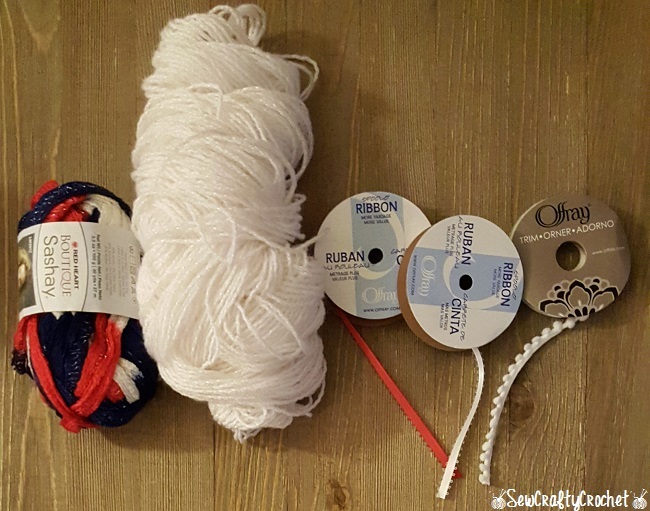 If you're also into Red, White, and Blue crafts, I'm hosting a month long Celebrate the USA Link Party with several of my blogging friends, and we'd would love to have you share your patriotic posts (old or new) with us. Very cute little horse. :) Great job on the re-do. This is so adorable! I love it! What a fun makeover. Pinning. I wanted to let you know we'll be featuring this at tomorrow's Snickerdoodle Party! This is such a lovely makeover. 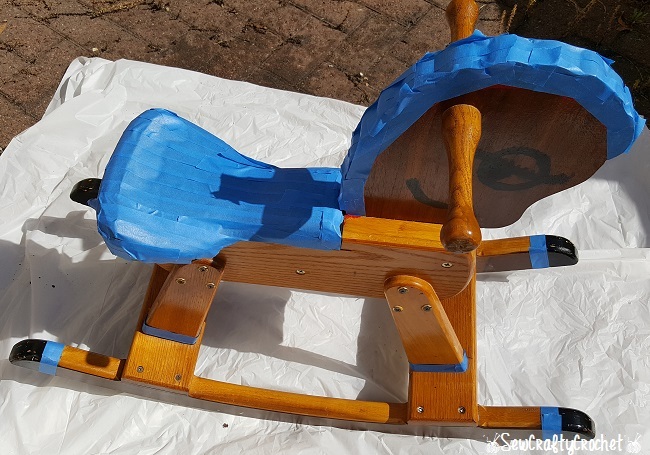 It was nice before but now this rocking horse is super cute.